A year ago, Acer was struggling and Jason Chen, its newly appointed CEO, thought the company could stay afloat by cutting its reliance on PCs and expanding in wearables and mobile devices. In view of the success of its Chromebooks and the pending release of Microsoft’s Windows 10, however, Chen is now doubling down on PCs. Chen is interested in gamers, in particular. The company wants to offer premium gaming products that could compete with desktop PCs from boutique companies like Origin PC and Falcon Northwest. In a flat PC market, gaming is a “bright spot,” and Acer is planning to release products that Chen says could appeal to the most avid gamer. “We don’t want to do amateur, part-time work,” Chen said in an interview. 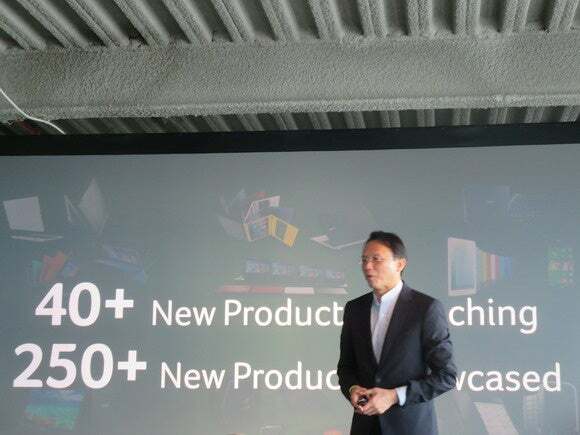 Acer wants to be the first PC maker to offer a complete lineup of gaming products including PCs, monitors and mobile devices, he said. At a lavish event in New York, Acer laid out a lineup of new gaming products including Predator laptops, desktops and a tablet. It was labeled as a “sneak peak.” Reporters were able to handle the devices, but were not able to boot them up. The stylish 8-inch tablet, which will ship in the third quarter, attracted the most attention. Acer declined to offer details on the device, which may end up getting a reception similar to that of Nvidia’s Shield tablet, which has a limited audience. Aside from Nintendo’s DS, portable devices like Sony’s PlayStation Vita or Nvidia’s Shield haven’t sold well. Acer also showed off the Acer XR341CKA, a curved gaming monitor that can display images at 3440 x 1440 pixels. It supports Nvidia’s G-Sync technology, which provides a smooth gaming experience by working in conjunction with GeForce graphics cards to display better images and reduce stutter and lag. The curved monitor will become available in the U.S. starting in September for $1,299. The gaming monitor, tablet, desktops and laptops give Acer a complete gaming product lineup that other PC makers can’t boast, Chen said. “This year, every two to three months, you will see new products come out for gaming,” Chen said. Acer will target Predator at the hard-core gamer crowd, and the existing V-Nitro brand for less serious gamers who may also use the PC for business. Meanwhile, Chen feels gamers are attracted by more than hardware, and that Acer needs to be involved in the gaming community. The company has formed a worldwide “Team Acer” group, to take part in and sponsor gaming events as part of its strategy to build relationships with gamers. Acer’s aggressive chase of the gaming market comes just as Microsoft releases Windows 10, which will provide a better gaming experience, with DirectX 12 APIs. But Acer is going to have to do a lot more than release fully loaded PCs. Big PC makers like Dell and Hewlett-Packard already have strong gaming offerings with unique designs and the latest and greatest technologies. Dell has been the more aggressive of the bunch with its Alienware brand, which has a Steam-ready gaming console and a unique accessory in which powerful graphics processors can be attached to a gaming laptop. Acer has made some progress in the PC market over the last year, becoming the largest Chromebook seller. The company was the world’s fifth largest PC maker in 2014, but its PC shipments declined in the first quarter this year by 7 percent year over year. The company did well in the U.S., but was hit hard in the EMEA (European, Middle East and Africa) market due to pricing pressure.